Why not consider enhancing the curb appeal of your home with the addition of a new paver driveway? 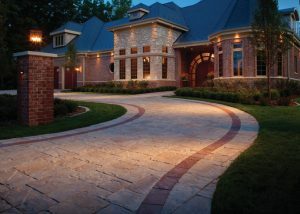 A paver driveway is an investment that adds value to your home while adding instant curb appeal. It is not only aesthetically pleasing but adds functionality and you can select a material that compliments the color and style of your home. In addition, this allows you to add accenting border as well as entry pillars with lighting, vertical walls, planting beds to further enhance the beauty of your driveway and home entrance. Contact one of our design professionals at IVY Studio, a landscape design and build consulting business based in Massachusetts at 781-591-0300 or vern@ivystudioMA.com to secure a no obligation consultation to review your driveway options.